There has been debate over the years on whether storing your bar in a “vertical” bar rack, with either end pointed toward the floor and ceiling, is bad for the bar, and whether it’s necessary or prudent to store bars in a horizontal rack instead, similar to a gun rack. 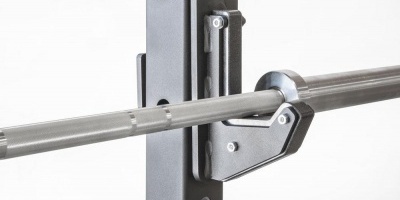 As far as bars with bearings in the sleeves, which are usually only high-end bars for olympic weightlifters who need the most sensitive spin, I advise against storing them in a vertical bar holder. 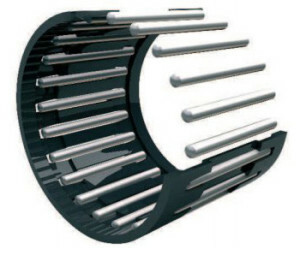 The reason is the needle bearings can be damaged by that kind of shock applied to the bearings when you drop it into the holder. Even heavy drops with bumper plates don’t damage the bearings, because they are oriented in a way that the load in that direction is fine, but they just can’t be dropped directly on one end, and you’re going to be in for a replacement if you test this out too much. However, most gyms do not have needle bearing bars unless it’s a gym that specifically caters to serious olympic lifters. You can tell it’s a needle bearing bar because the sleeve will start spinning at the lightest touch and continue spinning much longer than the much higher friction bushing bars. 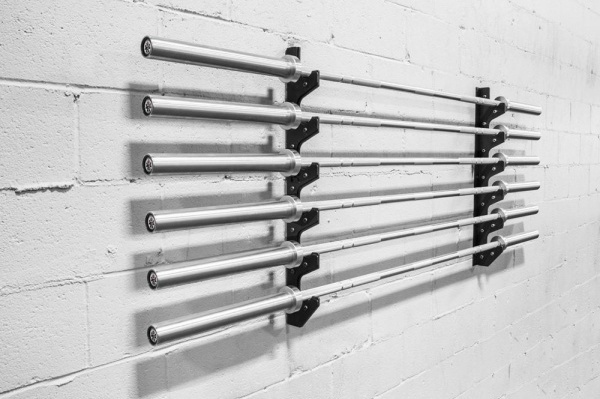 Usually gyms that cater to olympic lifters aren’t prolific with the mirrors that bodybuilders want, so a wall rack to hold bars horizontally can easily find a spot in such a gym. With any high quality bar with bushings in the sleeves you should be safer storing it vertically. There is still some potential for damage, as there are parts such as snap rings inside the bar that won’t really like being smashed. Many gyms only have vertical bar storage and don’t seem to have any issues. You can drop a rubber pad inside the base of the holder to soften the impact and mitigate the potential for damage. 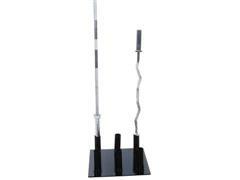 For hex deadlift bars and any other bars that do not have rotating sleeves, vertical bar storage isn’t an issue. There are no moving parts or oil to worry about. There is potential for the lubricating oil inside the sleeves to accumulate at one end of each sleeve when you store it vertically. The oil may also “pool” somewhat when it’s stored horizontally, but this isn’t an issue because once you spin the sleeve the oil is evenly distributed again. In reality this is hard to confirm. A lot of newer bars have the oil pretty well sealed in or just don’t seem to have an issue with being stored vertically. If the worst happens and you notice some oil dripping down the shaft the next day, don’t do it again (and maybe think about getting a better bar). Side Note – Adding More Oil: If you feel like the sleeves lost some oil by storing it vertically, or it has just gotten to the point where you feel like it’s spinning pretty roughly, stick it in a vertical bar holder and drip a few drops of oil down the shaft where it will drip down into the sleeve overnight. Spin the sleeve in the morning to distribute the oil. Flip it over and repeat for the other side the next day. For recommended oils and other tips, see Olympic Bar Maintenance. It can be mostly a cosmetic issue, but sticking a bar into a steel pipe is asking for surface damage on the sleeves. This might not be too bad, since iron weight plates can scratch it up pretty good as well. Some vertical bar holders like this 9-bar holder have PVC or some other material to avoid the scratching and annoying noise. Leaving a bar fully loaded on the rack isn’t a good idea long-term. A short time won’t hurt any high quality bar, but the longer it sits flexed in one position, the more stress is on it, and the more likely it will develop a permanent bend. But if it’s only a small amount of weight, ie: less than it takes to flex the bar even a minuscule amount, there’s much less risk of damage. This is one reason it’s good practice to unload the bar when you’re done working out… The other reason being it’s pretty much a mandatory courtesy in multi-user environments. Some folks can’t lift those 45lb plates easily, so be considerate! And finally after going over all the mistakes you could make, we get to the best way to store your bars. To avoid the above possible issues, store your bars in a horizontal rack. You can be extremely space efficient with an 8ft wide section of wall, storing all your 7ft and smaller bars on the rack from the floor to the ceiling. Some racks such as the one below are short but can be stacked 2-high to hold 8 bars, as long as you don’t mind the top one being 8ft high and needing a tall person to reach it. 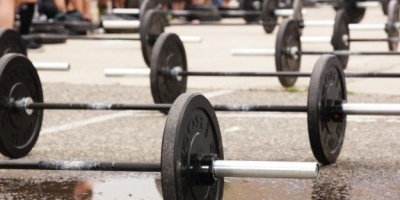 Also don’t miss out on our collection of the best articles on barbells.